Being a contributor and writer in the Fashion industry has its perks. One of said perks being I can go to NYFW and witness the amazing designers debut their collections. No I’m not just trying to make you jealous (maybe a little). I’m actually talking about the FW 2013-2014 collection shown by the very talented Elliot Giffs. Labeled ‘Never Forever’ it premiered this year NYFW in Feb for Fall/Winter 2013. I don’t know where Elliot Giffis has been hiding because his collection was amazingly unique and high fashion. Seeing this menswear collection was refreshing. It tickled my freak chic fashion bone by being something akin to ninja gear for a metro sexual. Although most collections that are shown at NYFW usually show a bit more of an Americanized style, his reflects more of an international quality. Curious yet? 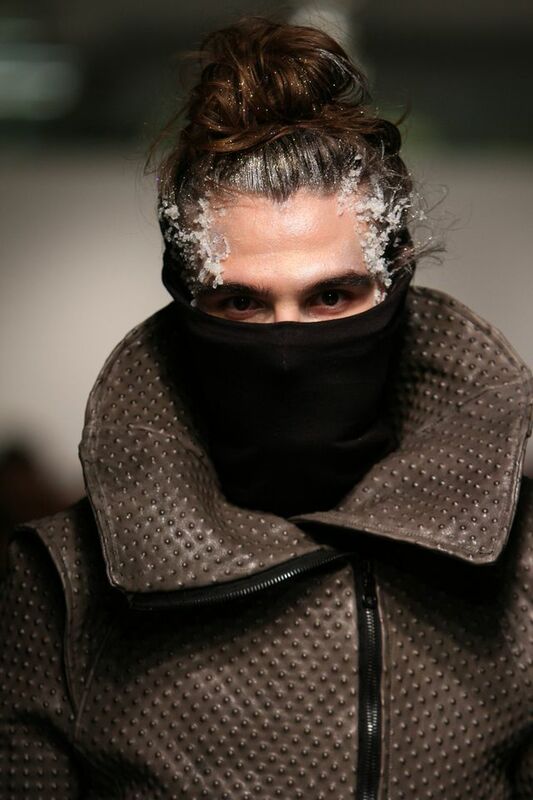 Check out the amazing runway photos from the Elliot Evan Fall/Winter 2013 collection pour homme. Huge thanks to Michael Shane PR for show invite and photos (Fashionable love and Champagne kisses darling! ).